The world lost an incredible mother, wife, daughter, friend, attorney, underprivileged advocate, and community member suddenly and unexpectedly on October 16, 2013. In honor of my late wife, Holli Wallace, I am training for the Hallucination 100 mile trail run and raising money for the Children's Grief Center of the Great Lakes Bay Region. Please check out this website for great running gear, fitness trackers, and other gadgets at great prices! Yesterday was the day that Holli and I met 19 years ago. 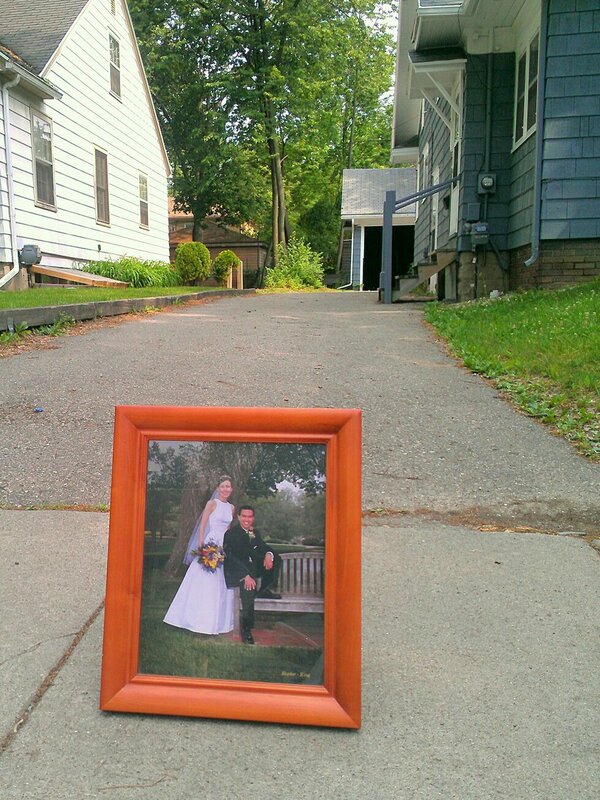 We met in the driveway of a house in East Lansing (photographed above by Holli in 2012.) Tomorrow will be the day that Holli and I got married 14 years ago. Holli used to joke that she would haunt me if she passed before I did, although I guess we expected this would be something we confronted in old age. It wasn't scary. It was a comforting idea. Of course, I don't believe in ghosts. That hasn't prevented Holli from haunting me and I am grateful that she does. Even after two and a half years, I still imagine her sitting next to me in the car or on the couch. I hear what she would say in response to both small and large events in my life. Memories replay on a daily basis with sad, but comforting detail. At times, the line between when she was here and when we lost her becomes blurred and I forget that she never saw Oliver play soccer, Elliott sell root beer floats, or even meet Peanut. I know that it is because I saw her there. I sometimes wish that I believed in ghosts, but I don't. This hasn't stopped Holli from haunting me. It is sad sometimes, but I wouldn't have it any other way. Now I need your help keeping Holli's memory alive by helping me support the Children's Grief Center of the Great Lakes Bay Region. 1) Go here to order a shirt before June 12. All proceeds go to the Children's Grief Center. 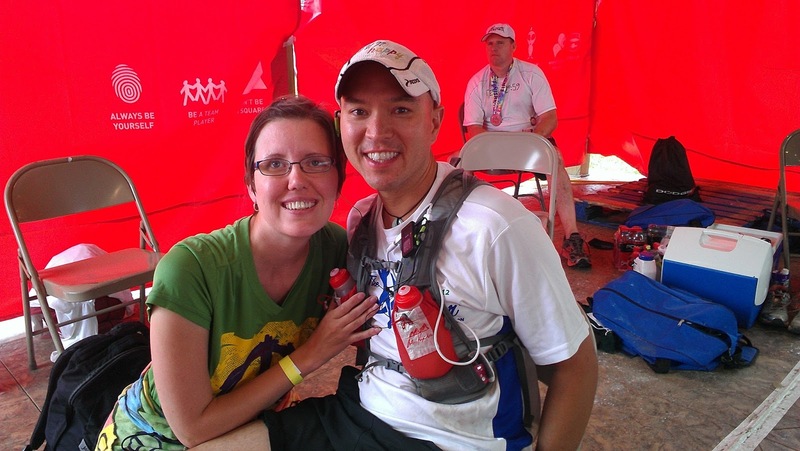 2) Make a donation here in honor of Holli and in support of my run in September. 3) Share this post and, if you knew Holli, perhaps share a memory of two also. Just to set the stage, I’m writing this from a hotel in Beijing while Denise and the boys are at the final grief support group potluck. It’s no secret that I like to travel and enjoy a job where that is one of the perks. Still, each trip brings a negotiation with guilt over leaving the boys and I am grateful to Denise and Mike for taking such wonderful care of the boys when I am gone. When I did the No Wimps Challenge at the end of April, I was pleased to reconnect with my old running buddy Dirt Dawg. We ran together for nearly the entire marathon. He actually paced me during my first attempt (and fail) at the Hallucination 100 back in 2010. That race, and even this trip in a way, reminded me of my race crew. Holli, of course, was my crew at all of my major races. For those of you unfamiliar with the ultrarunning world, your crew are the people who stay up ridiculous hours following you from aid station to aid station to fill water bottles, tend to sore feet, provide fresh shoes or clothes, remind you to eat, drink, or take electrolyte pills, check you for blisters, provide encouraging words, lie to you that you “look great!”, bring you food, put up with general crankiness, and basically keep you on track to finish. Needless to say, crewing a runner is more than a matter of just logistical support. In particular in 50 or 100 mile races, cognitive reasoning takes a hit. I’ve seen things in the forest that weren’t there (mostly wishful thinking that aid stations were closer than they are.) I’ve forgotten to eat or drink and neglected blisters. Towards the end of most races, I lose track of what I need and become convinced that I am unable to finish in the time allotted. This can become rather pronounced after 70 or 80 miles. It’s hard to spend 28 hours convincing yourself that finishing is possible. It becomes important at those times to have someone who knows what you need even if you don’t yourself know. While only a fleeting runner, Holli had become well aware of my preferences and habits on a race. I’m sure that she could easily carry her own in a conversation about the nuanced differences among socks and shoes that runners seem to enjoy. Most importantly, of course, she knew what I needed even when I didn’t. Having someone like that in your corner can take you incredible places and, among other things, get you through three 100 mile race completions. I won’t reiterate the now redundant point that my training is behind what I wanted it to be and I still haven’t ordered the t-shirts, although I have figured out which company to use. I’ll highlight more positively that my training is still on track for the race and that I will “officially” launch fundraising efforts when t-shirt become available in a few weeks. I want to thank Mario Volante, the Awad family, and Uncle Wing and his family, for their donations so far. I also want to say a special thanks to my mom and dad for their generous contribution.